Monthly Favorites – April Edition! Monthly Favorites: April Edition! 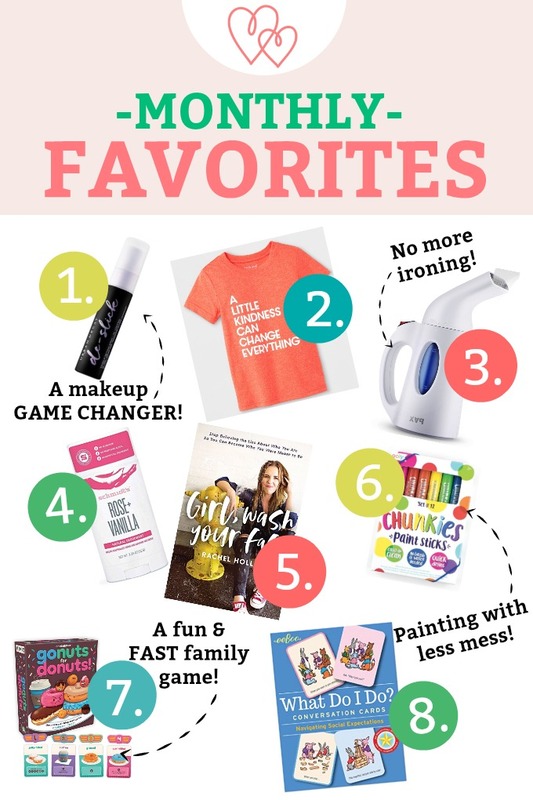 The new makeup product I never knew I needed, a fun game, a good book, and more! GUYS. It works. This is not a drill! It’s helped my face makeup (blush/highlighter/all the things) STAY PUT throughout the day instead of rubbing/sweating off or fading as the day goes on. Even when it’s hot. It has a light, fresh scent, mists on easily, and has really changed my makeup game. And I can use all the help I can get, because our temperatures are already in the 90s folks. And will be 90 or hotter until after Halloween. PS – Most of my other make-up favorites are mentioned in this post. Allllll the people in the land have been recommending steamers instead of irons lately, and I finally decided to try one. I hate (H-A-T-E) ironing–we have the world’s largest ironing board, my kids always magically know when I’m wielding a hot, pointy iron and come bouncing around while I try to protect them/iron the clothes. So… we mostly don’t iron. I watched a steaming tutorial from the Piper & Scoot IG account a few weeks ago where she rescued a rayon dress that had been machine washed when it shouldn’t have been, and that convinced me. I ordered the small size since it’s easy to bring with you when you travel, and SUPER handy to store and whip out at a moment’s notice. I like it SO MUCH BETTER than ironing! Turns out, I’m a girl who has blogged about natural deodorant many, many times. But hear me out. This rose vanilla deodorant smells GOOD. I usually REALLY dislike vanilla perfumes and lotions, so I was hesitant when I saw this scent. I’ve liked their Geranium and a special edition “Wave” scent they did recently, so I thought I’d give it a try. I LOVE IT. I really only get the rose scent coming through, which is so nice and fresh. Schmidt natural deodorant usually works great for me in the fall/winter/spring, but I haven’t given it a try in summer yet. We’re headed into a week of mid to high 90-degree weather, so it’ll really get put to the test! (For summer, I’ve loved this natural, super-duty jasmine deodorant, which lasts well in HOT temperatures). 5. Girl, Wash Your Face! I mentioned this book in my newsletter a few weeks back, but I listened to it again and really enjoyed so many of the chapters. 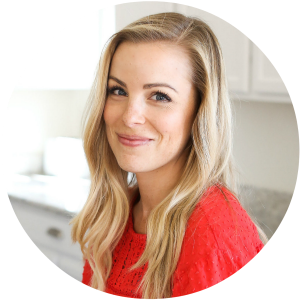 Rachel Hollis is a REALLY fun person to follow online, and I find myself cheering for every new success she has. This book is a good one. A fun one. An inspiring one if you have any area (work, relationships, health, goals, etc.) you want to work on. And it’s easy to read or listen to (I loved listening to it–it was like having a long lunch date with a friend giving you a pep talk!). My kids have had some extra time home this week with colds and school closings, so we’ve been extra grateful for these Chunkies paint markers. They’re MUCH less mess than busting out the watercolors, and they’re as easy to use as crayons. Both kids LOVE them. I just stick a little plastic tablecloth or placement (or a cookie sheet) under their paper, and the mess is totally contained! 7. Go Nuts for Donuts! Our kids have gotten really into games lately, and we’re always looking for something new to fold into the mix. Go Nuts for Donuts is our latest addition. It’s fun, cute, and fast, so you can play as many or as few rounds as you like. (I cannot play loooooong games. I just can’t do it.) We love every game we’ve tried from Gamewright (they made our favorites–Sleeping Queens, Sushi Go! (and the Sushi Go Party! version). If you’re looking for a quick and easy game, this is a good one! It says ages 8+, but 5 year old Milo and 7 year old Sophie can play without any trouble (other than we help add up his score at the end). 8. What Do I Do? Cards. I found these at Target right before Sophie’s birthday and picked up a deck. These What do I Do? sets are fantastic little social stories to walk through different social situations. Like how to introduce yourself to someone, what to do if friends are talking badly about someone else, what to do if you’re upset with someone, etc. If you’re working on emotional or social literacy with kids, these are a great low-pressure way to do it. They turn the topic into a game of sorts and help prompt some role-playing situations. They’re terrific if you have a child with special needs, or a child who is shy or even a bit awkward at times. If social situations aren’t your need, they also makes sets that talk about helping friends (and yourself) with feelings, one about good manners, etc. What do YOU love lately? 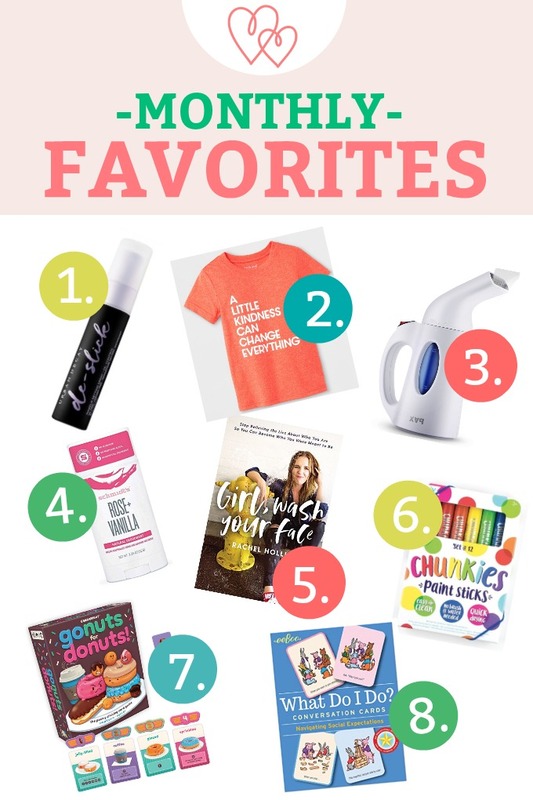 PS – Love monthly favorites? You might love the weekly newsletter. I include something helpful or new, a handful of weekly favorites, and the posts from the week. You can sign up here if you want to jump on the list! I always enjoy your Monthly Favorites! I’ll share a couple of things new to me that I like. I use diced tomatoes a lot in cooking. This brand of chopped tomatoes from Italy – that comes in a carton – is superior to the canned brands. I buy them at Target. Walmart also carries them. I like “destination tees” and the London Tee at J Crew Factory is fun. It’s good quality, with some weight to it. I love the graphics. I’m not sure my hyperlinks will work, but the description should be enough to find these. Ellen – I LOVE the Pomi tomatoes! So good. I get them at Sprouts, too! J Crew/J Crew Factory make my favorite graphic tees. I just got this one from J Crew. LOVE IT! Cute pink tee! I’m glad to hear Sprouts carries Pomi; they’re very close by. By the way, thanks for turning me on to California Olive Ranch EVOO – it’s the best! It’s at Target here. Just put the “What Do I Do?” cards in my Amazon cart. Still reeling that one of Grandma Lynn’s progeny doesn’t love ironing! Hoping that fabulous t-shirt comes in big girl sizes, and anxiously awaiting your verdict on the hot-weather tested deodorant! We don’t do games (successfully) at our house, so a friend told me about Ungame. I bought it in child and teen versions and it’s a huge hit, so that’s what I’m loving this month! Well that sounds like a perfect choice! We play LOTS of games, but we also have a LOT of sad/mad reactions that pop up on the regular. I think that Ungame sounds like something that would be good for us! THANK YOU! I love your Monthly Favorites posts!!! I usually buy at least a couple things from them, please don’t stop! 🙂 I already carted that adorable Target shirt for my daughter, the paint sticks, and I need that setting spray! Melissa – You always leave the NICEST comments! Thank you!!! I think the setting spray *might* just changed your life 😉 It’s been like magic for me! (My makeup isn’t gone by noon!). I love Primal Pit Paste too, but the baking soda is giving me problems. I’m trying out a couple of different baking soda-free options right now – Meow Meow Tweet and Little Seed Farm. So far, so good but I’m not sure how they will hold up in the summer heat and humidity here. Side note – have you tried Primal Pit Paste tooth powder? I’m using the mint and the charcoal ones right now and so far loving them!